Out of the top 100 most deprived areas in the UK, 48 are located in the North West. Many of United Utilities’ customers are in debt or struggling to make ends meet. These individuals want to pay their way, but without the right help end up falling behind on bills and getting into greater difficulty. United Utilities wanted to help. It tasked Intelligent Conversation with designing and delivering a stakeholder engagement event that would attract over 100 delegates from charities, agencies and local authority departments who regularly interact with individuals in/at risk of financial difficulty, as well as fellow service providers. The event needed to provide a platform to raise awareness of existing services/initiatives already offered by United Utilities. This would help customers with the issue of affordability and encourage feedback, advice and insight that could directly impact new/adapt existing services, to better help. To bring together the people who mattered and get the North West talking, a bespoke database was created. This encompassed charities, agencies, politicians and councillors, and fellow service providers across Merseyside, Lancashire, Greater Manchester, Cumbria and Cheshire. 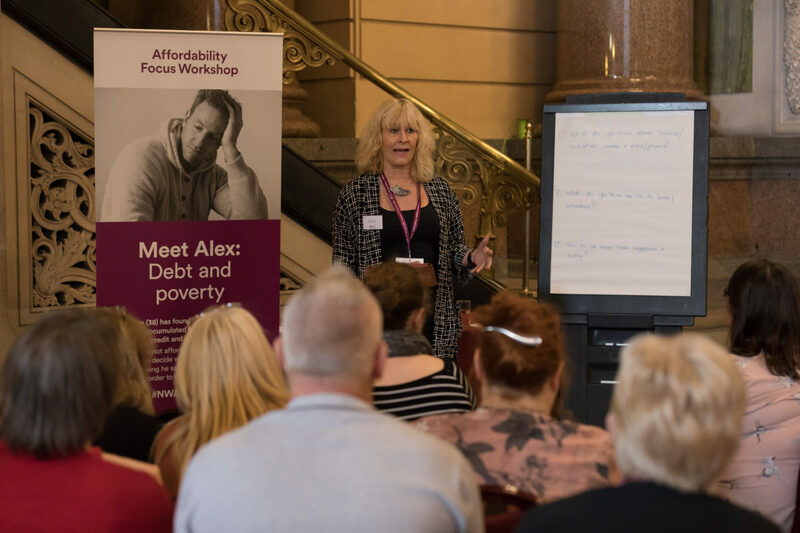 The event, held at St George’s Hall in Liverpool was held in January on Blue Monday – a day recognised as a time when the consequences of being in debt or struggling to stay out of debt comes to a head for many people. Angela Eagle MP was invited to deliver a keynote address about challenges facing her constituents (Wallasey, Wirral). Baron John Bird, MBE, the founder of the Big Issue, was invited to deliver a closing speech entitled ‘Don’t let the conversation stop’, outlining the importance of making best practice happen beyond the event. Partner organisations were given the opportunity to take free stands in the breakout room. The decision was also taken to partner with The Samaritans and their ‘Brew Monday’campaign (which stresses the value of a brew and a chat to help deal with problems), again linking in to the collaborative theme for the event. To boost creativity, ex-opera singer Alistair McCall provided a bespoke creative session for the landmark Liverpool venue entitled ‘Be more Ringo’, using music and group participation to encourage attendees to work together from the off. interactive polling – every attendee had a keypad to answer specific questions. This also enabled us to tailor the day according to feedback e.g. relating to knowledge of key services around affordability. Every attendee took part in two interactive workshops to share their views and insights. To keep the sessions ‘real world’ relevant, discussions were based on two pen portraits – an individual (Alex) in debt and a family (the Parkers) just about managing (JAM). To ensure participants connected with the pen portraits, we commissioned pop-up banners illustrating these stories (posed by models). The pop-ups were present in each session break-out group. The sessions were filmed and annotated for review and analysis after the event. A post-event letter was sent to all North West MPs offering them the opportunity to meet United Utilities to discuss the work they are doing to get people in their constituency out of debt and reminding them of the schemes available for them. 117 delegates came to the Summit – 100% of feedback received was positive. A progress report is being issued every eight weeks to keep attendees informed about the progress being made by UU and partner organisations in these areas. Based on delegate feedback, the Summit is to become an annual event and the date has already been set for 2019. Can I say what a great event that was... I thoroughly enjoyed the whole day and having spoken with other attendees we were all deeply taken with United Utilities͛ commitment to helping their customers through difficult times.